In recent years, the features of composite materials and their manufacturing processes have undergone considerable development to obtain structural products and to investigate the sectors and application fields where they can be used. One manufacturing process which gave the best performance results is pultrusion. Pultrusion is a continuous process of composite materials reinforced with fibreglass or carbon fibre. Consist in the extrusion of profiles with a constant cross-section which is continuously pulled in a closed mould polymerisation. The pultrusion process produces profiles that sometimes give greater guarantees than those made of steel and stainless steel. The profile comes out of the mould and is ready for cutting. The reinforcement fibres are arranged longitudinally and are made up of complex roving systems and glass or carbon or Kevlar fibres. They make up about 70% of the profile and determine its tensile and flexural strength. The pultrusion process guarantees the customisation and the repeatability and perfect reproducibility of each product. 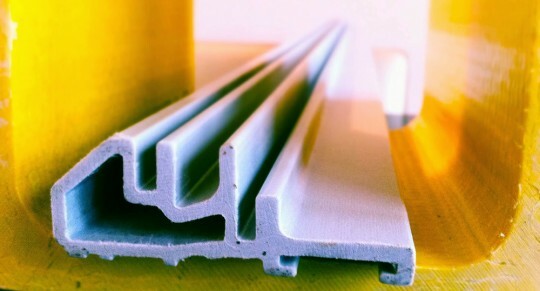 Although the manufacturing process is still quite slow, the energy consumption required is lower than that required to produce the same aluminium profiles. Fiberglass pultruded and carbon profiles are environmentally friendly, resistant to rust and corrosion and once implanted in soils or near groundwater they do not release toxic substances. If you want to learn more about the features of this working process, contact us and we will lead you to the discovery of pultrusion and pultruded profiles in fiberglass and carbon fibre.